Nick McGregor found his passion for cooking on the West Coast where localism and product sustainability are king. 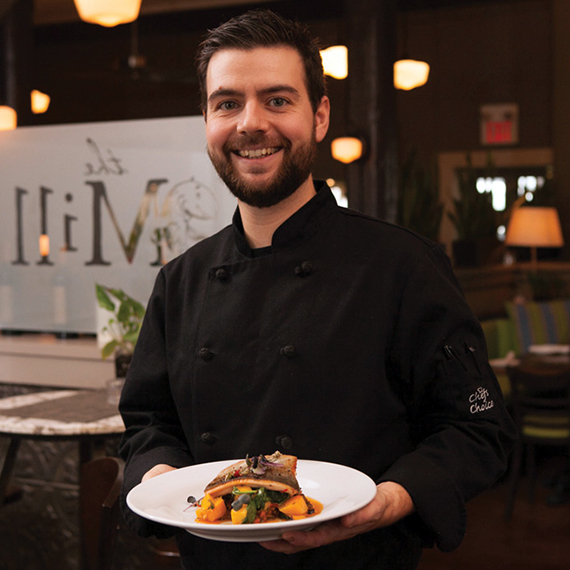 Now, you can get a taste of his West Coast flare at Sisi Trattoria in Thornbury, Ontario where he is currently head chef. Nick is also curating the July CHEF'S BOX monthly food subscription for FoodiePages.ca. We got the inside scoop on Nick's favourite eats, his hidden talents, the best burger, and more. Signature dish: Heres a dish that I am currently excited about, 'Pisarei' Gnocchi (bread gnocchi made from leftover focaccia) Tomato braised beef brisket and pork sausage, crispy eggplant, pine nut and confit lemon gremalata, and Grana padano. I have a few: Too many lists... I have lists for my lists. In the kitchen, I swear by: Pickling - my current favourite is celeriac and peaches. The taste I couldn't live without: Mustard, and sandwiches, ha. Hidden talents: Guessing the weight of an ingredient before I weigh it. If my kitchen could talk, it would say: There are far too many animal noises being made and everyone is in on it. I get nervous when: I drink too many Cappuccinos! 1. The Woodlot, Toronto: Gnocchi. One of the best gnocchi dishes I have had was at the Woodlot - the whole pasta was amazing but the gnocchi themselves were so pillowy with the right amount of bite. 2. Biff's Bistro, Toronto: Bone marrow. Roasted bone marrow perfectly accompanied by a caper berry and parsley salad. A great dish. 3. Pizzeria Libretto, Toronto: Nduja and rapini pizza. I love nduja and Pizzeria Libretto's pizzas are top notch. This pizza holds a special place in my heart. 4. The Marina Restaurant at the Oak Bay Marina, Victoria: Sushi. To this day I have not had sushi as good as at the Oak Bay's Sushi Bar. It's amazingly fresh, local and executed with perfection. 5. Pecorino Tasting at Podere il Casale in Italy. I went on a tour at this organic cheese farm just outside Pienza. They also make wine, olive oil, and grow vegetables. They have some pigs too, but their bread and butter is the Pecorino Cheese. After an extensive tour with the owner, we sat in the courtyard and ate all the varieties of cheese they make. The farm works on a volunteer basis and chefs from all over the world seem to be the majority of the help. Amazing. The best farmers' market: Mercato Campo de Fiori in Rome. There are so many truffle vendors, and the pasta variety is ridiculous. The vegetables are amazing. The best burger: I am always on the search for a good burger. The Tremont Cafe in Collingwood is the top on my list. Morbier cheese, caramelized onion, with hot djion, on a rosemary brioche bun. The best cheap eats: The Flying Spatula in Flesherton. Sunday brunch is $12, and everything they serve is local and made in-house. They serve up the usual breakfast goodies, as well as roasted ham and beef, salads, stroganoff and an assortment of tarts and cookies. My motto: Good food takes time. I was told this by one of the chefs apprenticing me in Victoria. It was a profound moment in my career and the phrase has stuck with me though my career. The July CHEF'S BOX curated by Nick McGregor is available on FoodiePages.ca until July 31st and includes incredible small batch foods as well as Nick's recipes for Pickled Plum Kale Salad, Grilled Local Lamb Chops, Mushroom Risotto, and Dark Chocolate Peach Raspberry S'mores!